If you could design your own flavored beverage online, then click to have it “printed out,” would you? How about if you could share it and earn a part of the profits? 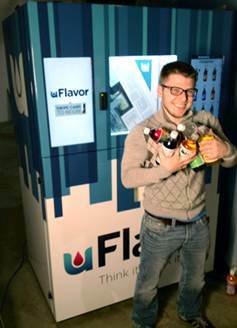 Welcome to uFlavor’s app-like drinkable future. Picture this: You are sitting in, say, a Bermuda hotel on vacation. Suddenly you are struck by a crazy idea for a new soft drink taste. So you dial up a website, and with the guidance of a simple system you digitally mix the ingredients, adding 1% more cinnamon, a dash of lime, the merest hint of mango and control the carbonation to create a fantasy beverage that’ll explode on the tongue. Then you refine the color of the drink, design a label, and order yourself a bottle or two. Soon enough, they arrive in the mail. Now, since the system is social, a person visiting an associated vending machine in, say, Dayton, Ohio, just moments later could be attracted by your drink’s potential, press a button, and have a liquid delivered that matches your design. And you get a portion of the profits. Incredible, right? And don’t overlook the implications, which could be enormous, especially if you manage to craft a drink that’s more attractive than any of the billion-dollar brands that are out there, and the taste catches on. That’s the ultimate goal of new company uFlavor. By now we’re familiar with the idea of 3-D printing, a tech that’s being applied to everything from small plastic parts to human bone to entire buildings in space. The trick is properly known as rapid prototyping, although advances in the tech mean the output from these machines is fast becoming more product grade than prototype-like. In a way that’s what uFlavor is trying to do for soft beverages, printing out spurts of flavor, water, carbon dioxide, and other ingredients through a drinks print head into a consumable beverage. And its instant drinks manufacturing could be to Coke’s Freestyle flavor-mixing machines what chef Heston Blumental (him of snail porridge fame) is to McDonald’s menu selection. If you’re reeling at the thought of a flood of nearly identical drinks, in a market that’s already confusing (have you stolled down the soft drinks aisle in a supermarket and just looked at the array? ), then don’t. The team behind the innovation spoke to Fast Company, and assured us that they have a couple of core values front and centre–starting with taste. So, far from a pedestrian “raspberry with lime or strawberry with cola” mix, uFlavor has the potential to be hugely sophisticated from a food science point of view: Literally millions of flavors, which will appeal to the palate in a different way. “What will come out of this,” Cloran suggests, “is entirely new flavors that the world has never seen before.” It’s radically different than Coca Cola’s heavily brand-leveraged flavor, he argues: “Even in their Freestyle machine, with 100 different flavors, they have their pre-mixed ones in there. And yes, you can create a ‘suicide’ with 50% of that, 10% of this…but you’re just mixing Coke-flavored syrups.” Cola, the team highlighted to us, only has around 15 main ingredients in it, in precise proportions that result in the famous Pepsi versus Coke tastes. But uFlavor lets you control the ingredients down to percentage points and thus experiment with subtle gradations or bold differences that Coke or Pepsi wouldn’t do. But the really clever part is the social sharing aspect. If you’re familiar with Star Trek, (and if you’re reading this, I’m guessing you are), then you’ll know about food replicators–clever part-teleport machines that can synthesize almost any dish or drink on the spot. Captain Picard famously had a recipe for “tea, Early Grey, hot” that he loved. But the system was presumably smart enough that Lieutenant Worf could equally have asked the machine for “tea the way the Captain has it.” That’s roughly what uFlavor has in mind. As well as designing your own drink, you’ll be able to share it. And if by some magical trick your drink becomes popular and people start talking about it and demanding it from uFlavor vending machines, then you’ll have a hit on your hands–aided by suggestions from uFlavor’s system, which learns users’ profiles and their preferences, and then suggests new drinks you may like. That’s the point at which the Star Trek metaphor breaks down and an iTunes one takes over–because you’ll get a percentage fee for every time someone buys your drink. In its first prototype iteration, the company’s flavor printer mixes 42 different ingredients at 300 gradations, and they’ve chosen five example novel drinks to launch with–produced by the machine, but without the design-your-own angle, although you can design the label (perfect for branding, say, a kid’s party). In three months they’ll add more drinks, crowdsourced from community voting, and then in three months they’ll have a full manufacturing run of their complete 100-flavor print-head, which will produce delivery-ready bottled drinks at their factory, and ultimately in vending machines. Is this the future of soft drinks? If you were a betting person, you’d love to know the answer to that given the sheer dollar value of the industry. SodaStream, as a recent example, has pulled off a dramatic pivot that took its simple carbonate-at-home drink production model (one that’s been around for decades) and turned it into a highly successful boutique industry. But uFlavor’s offering is a whole level of novelty and sophistication on top of SodaStream’s: By offering billions of flavors compared to SodaStream’s limited number of syrups, uFlavor has the potential to be more popular many times over. It’s not out of the realm of possibility that uFlavor can become a brand name–without its own product– the size of Pepsi. But even if it doesn’t, it suggests that there is a brave new world of food production about to burst upon us, where the consumer can choose flavor, texture, caffeine or vitamin content, and packaging. It will be interesting to see what the marketing industry makes of this.